When we traveled with a group of food and wine writers to the beautiful Santa Maria region of Central California, we expected and found exquisite wine, but we were surprised to discover that the area’s unique style of barbecue is just as impressive. The Far Western Tavern, located in Orcutt, north of Santa Barbara, is well known for serving outstanding Santa Maria BBQ. 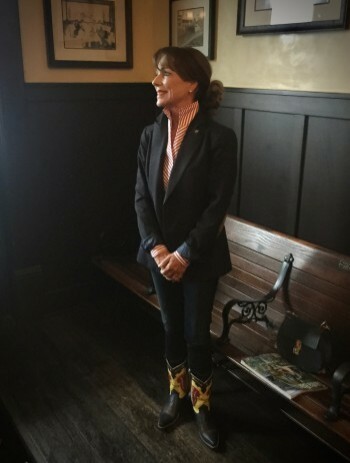 We were fortunate to meet one of the owners of the Far Western Tavern—personable Susan Righetti, who talked with us about the three generations of her family who founded and have managed the tavern through more than five decades. Established in 1958 by Susan’s parents, Clarence and Rosalie Minetti, and a cousin Richard Maretti and his wife, the tavern was first located in an historic hotel building in the town of Guadalupe, California. In the 1990s, after the Maretti family retired from the restaurant business, the Minetti family decided to continue the venture, which they moved to their current location in Orcutt. It is admirable that the family donated the original restaurant building to the Guadalupe Nipomo Dunes Center where it is being transformed into a museum. The restaurant’s welcoming rustic interior is striking with fascinating Western art on the walls and a gorgeous wooden back bar that was brought from the original Guadalupe location. 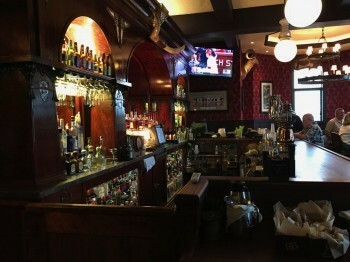 This is the kind of bar where you might want to linger for a while and enjoy the inviting ambiance while you chat with cowboys enjoying their favorite craft beer or special cocktails. Our group of food writers relished the variety of dishes we ordered, particularly the Santa Maria BBQ entrees. After ordering cocktails or wine, we started with an enticing array of creative appetizers, including tasty Sweetbreads that had been grilled over red oak; scrumptious Prosciutto Wrapped Jalapenos filled with cream cheese and topped with a roasted red pepper coulis; Grilled Artichokes with a spicy Siracha remoulade; Puff Pastry Wrapped Linguica (Portuguese sausage); and luscious Mac n’ Cheese Rellenos. For my main course, I ordered a 6-oz center cut tenderloin filet mignon (photo above at beginning of article), which was perfectly medium rare and one of the best filets I have ever had. I think it was the Pinot Noir mushroom reduction sauce that really set it off. Others at our table were equally pleased. 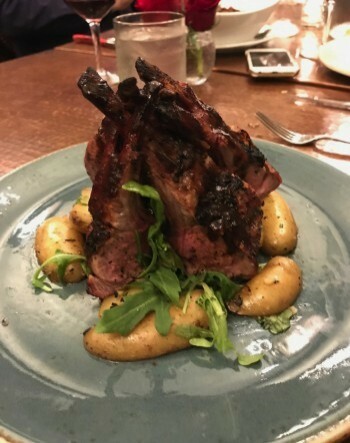 In particular, there were rave reviews of the Oak Pit Roasted Rack of Lamb (photo left), with a red wine veal reduction sauce, and the steak dishes prepared Santa Maria style such as Oak Grilled Tri-Tip, Bulls Eye ribeye, and the Cowboy Sirloin. Some of us ordered our meals “Tavern Style,” which included a tangy Bay Shrimp Cocktail and soup or salad. 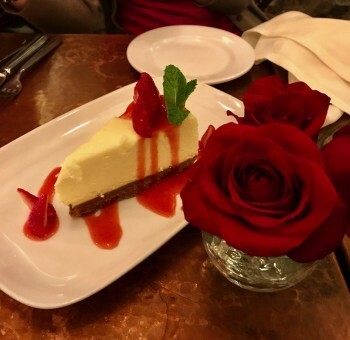 The restaurant has a new pastry chef and the desserts we sampled were also delectable, such as apple crumb cake, a variety of brulees and a strawberry-topped cheesecake. The Far Western Tavern also offers an extensive beer and wine list, featuring Central Coast and Santa Maria wines. Each month the restaurant hosts a popular winemaker’s dinner featuring local winemakers. 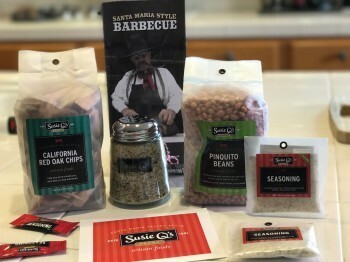 We were thrilled to learn that through Susan Righetti’s company, Susie Q Brand, we could purchase (and order online) a variety of Santa Maria BBQ products, such as seasonings, Pinquito beans, salsa, and red oak chips for our own barbecuing endeavors. I think I can say with confidence that any time we are in the Santa Maria area, we will stop by the Far Western Tavern. 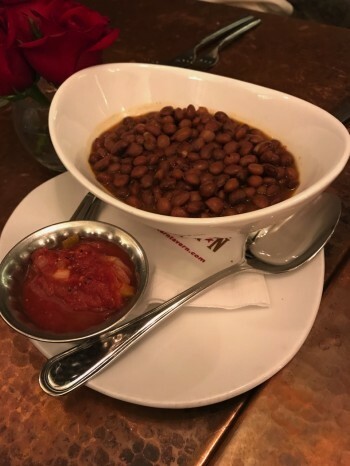 Its combination of historical ambiance, an inviting dining room and bar, a friendly staff, and topnotch cuisine make this restaurant truly memorable. The Far Western Tavern is open five days a week for lunch and dinner, with brunch on Saturdays and Sundays. It is closed on Mondays.